At Intelligent Interiors, design starts with the person. The products and how to apply them follow. Our goal is to enable individuals to work at their most safe, most effective and motivated levels. We create health-positive environments that go beyond “fitting” people to their equipment to actually helping them thrive. Whether in the office, in the home, or in healthcare facilities, our award-winning products create a healthier, more comfortable and productive environment. We have ergonomists that can come to your space, assess your current working habits and make suggestions for solutions to create a more comfortable work environment for employees. Our ergonomic tools help employers, not only create health positive working environments, but also decrease the standard employee workstation footprint, decreasing cost per station and increasing capacity of employers in the overall space. 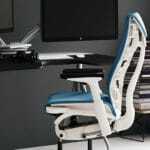 By applying the science of ergonomics to work habits and workstation design, we can help any organization reduce risk factors while increasing employee health, comfort and productivity.